I finally found a while to listen to the LP and I enjoyed it a lot ! I wasn't aware at all that Yueh Hua was also a good singer ! Does anyone know if he sang in other LPs or if it's just this one ? Also, the last song of the side 2 is in Cantonese and is familiar to me. 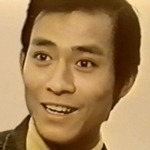 Does anyone know if it's the theme song of the ATV series Gone with the wind in which he played and if he is the original singer for the theme of hte series or if he just sang it for the LP, please ? Does Yueh Hua play a good guy or a bad guy, here ? It looks like he wears a similar costume as in the series Bitter conflict. I would love to find a Mandarin language version of this latter !! he played a good guy, though he was on "the enemy's side" from the perspective of the female lead--this is the atv adaptation of LYS's ping zong xia ying lu. ngok wah played tantai mieming, on the "montague" side with zhang danfeng.